First of all, the packaging. It's like a sleek pencil. With a felt tip that is tapered. It's black with white text printed on it. I like how the font of "master precise" looks as if someone wrote it down with a felt tip pen. I have the eyeliner pen in black. It contains 1 ml of liner and can make thin lines of 0.44 mm, according to the packaging. It has an "ultra-fine tip", to which I totally agree. I can make very fine, dark lines with the tip and when I want a thicker line, I push the pencil a bit harder on my lash line so that the thicker part of the felt tip touches my skin and leaves a thicker line. I also find it very easy to create a wing. I just "stamp" a wing on my eyes with the tip and fill in the gaps. It's so convenient! The line it leaves is completely black and no skin is showing through. I have been using this particular eyeliner pen for about 5 months now and it is starting to dry out a little bit. Until a few weeks ago it was still working perfectly. The tip is starting to dry out, so I am keeping it upside down. I can do one eye with no problem and for the second eye I have to run over my lash line a few times. I guess it's actually time to toss it, but not before I have used it to swatch it for you! The liner does not feather when I swatch it on my hand. I can make such precise lines with it. I can't express how great I think this eyeliner is. I have tried two other liquid eyeliner pencil than this one and that is one of Essence and one of Kiko Milano. The color pay-off of the Essence one was good and it didn't feather of smudge, but I didn't like the tip. It didn't work as fine as this tip for me, I ended up not using it after a few weeks. The other one wasn't actually an liquid eyeliner pencil, it was an eyebrow marker from Kiko. 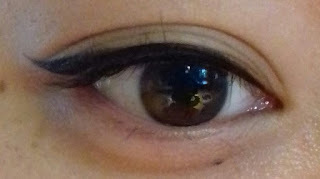 It was too dark for my brows, so I used it as a dark grey eyeliner pencil. It worked fine, not as bad as the Essence one, but I still preferred the Master Precise. 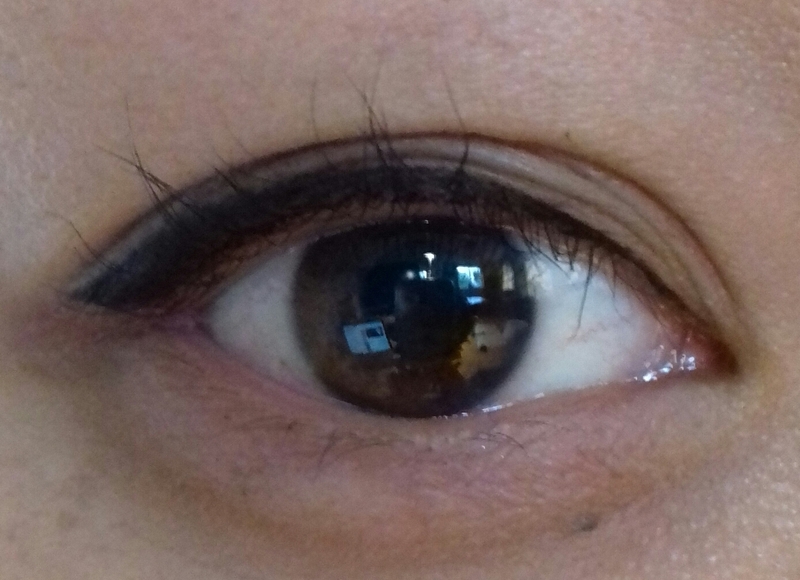 Below you can see two different, simple looks I made with the eyeliner. As you can see, it's easy to make a sharp wing with the pencil. I think it's a great liner. I love the thin, long, sharp tip, because it makes lining my eyes so easy, I just lay the tip flat against my lash line and drag it along my lash line. It creates a beautiful, intense black line without feathering or whatsoever and it doesn't smudge on me during the day. So if you are looking for a great eyeliner with a long, thin tip, I'd say go get this one! I also think it is perfect for those who are starting to use liquid liner, because I mastered the liquid eyeliner skill with this little gem 💕.